Simple syrup is a bar staple and an easy way to add a little bit of sweetness to any drink. Simple syrups don’t have to be plain, however. They can be infused with all kinds of flavors to add new dimension to cocktails. 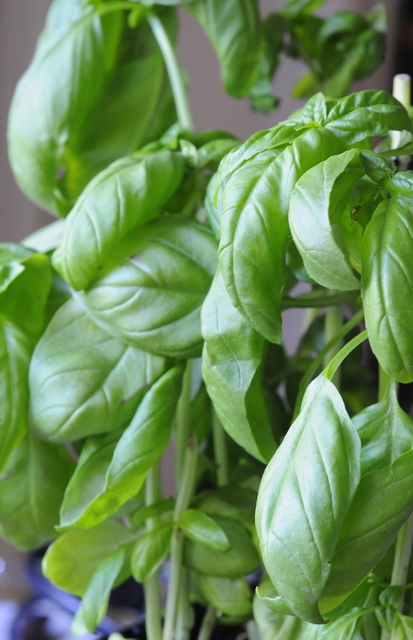 This Basil Syrup is an easy to make simple syrup that features fresh basil. It has a slight green color and will add a subtle savoriness to any drink that you might want to add it to. It goes particularly well with berries and citrus, where its strong herbal aroma highlights the sweetness of those ingredients. Combine the water and sugar in a small sauce pan. Bring to a boil over medium-high heat and stir occasionally. When the sugar is completely dissolved remove from the heat and add the basil. Let steep for about 30 minutes. After steeping, strain, cool to room temperature, and store it in the refrigerator. ← Previous Post: What is Ginger Beer?